Sometimes we get all too wrapped up in the potential of plans and we just need to go get outside and just search... this morning was that case. Weather reports where showing that my previous ideas for epic coastal sunrise photos were fogged in and had little to no hope of happening. After some whining about that over instant message with a friend, I came to the conclusion to just grab my stuff and go south. I had a couple of ideas, but no real plan... 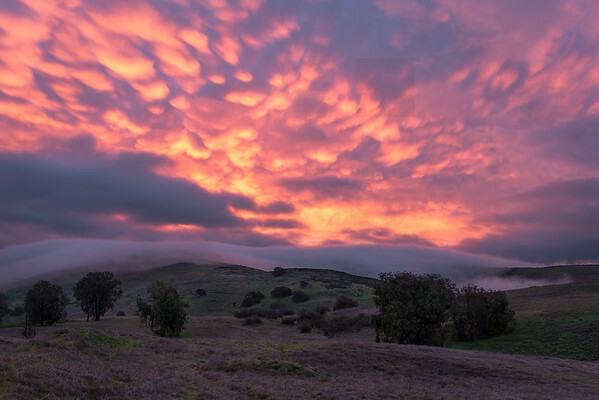 I just drove and as the sun started to rise over some random area of South San Jose, I watched those mammatus clouds start to light up over the low valley fog and knew this was the sunrise to shoot.